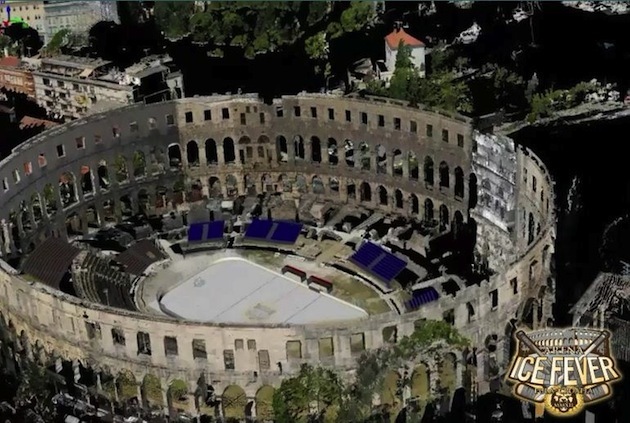 In June, Erste Bank Hockey League (Austria) team Medveščak Zagreb announced that it would play a pair of games in September inside the Pula Arena, a Roman amphitheater in Croatia built between 27 B.C. and 68 A.D. At one time it seated about 20,000 spectators as gladiators did battle until emperor Honorius banned the fights in the 5th century. Earlier this week construction began on the rink for the two games to be played Sept. 14 and 16 featuring Medveščak Zagreb facing off against Tilia Olympija (Slovenia) and UPC Vienna Capitals (Austria). Over 150 tons of equipment were delivered on 22 trucks from Italy over six days to Zagreb. According to the team, the rink dimensions will be approximately 187x85 and built on top of a wood platform. The stands will hold a little over 7,000 fans for each game and will be built in stages due to the terrain inside the amphitheater. A team spokesman says that the ice-making process is expected to begin on Saturday and over 18,000-square meters of special foil will be used to protect the ice from an average temperature of between 15-19 degrees Celsius (59-66 degrees Fahrenheit). The entire event will cost around 500,000 Euros (approx. $627,000 USD) and will be paid for via ticket sales and sponsors and partners. If they're looking for a way to spice up the pregame festivities, we hear there's a certain Spartan who hasn't worked a hockey game since spring of 2008 and has to have memorized his speech by now. 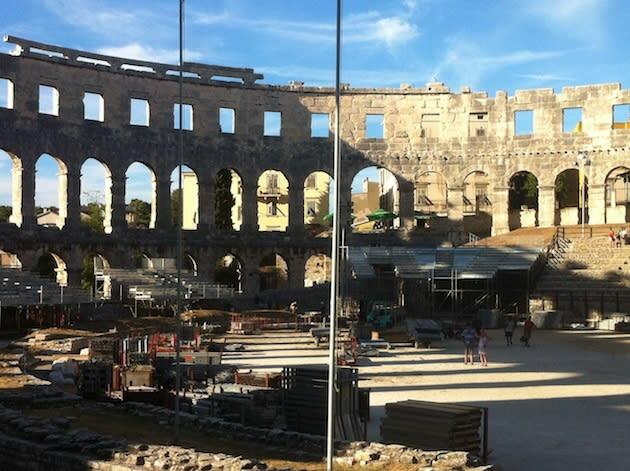 For more construction photos, check out Medvescak Zagreb's Facebook page where it is featuring daily albums of the progress in turning a Roman amphitheater into a hockey rink.